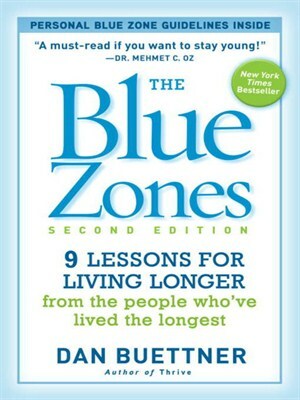 Dan Buettner, "The Blue Zones: 9 Lessons for Living Longer From the People Who've Lived the Longest, 2nd Edition"
Since publishing his bestselling The Blue Zones, longevity expert and National Geographic Explorer Dan Buettner has discovered a new Blue Zone and launched a major public health initiative to transform cities based on principles from this book. The Blue Zones, Second Edition is completely updated and expands his bestselling classic on longevity, drawing on his research from extraordinarily long-lived communities–Blue Zones–around the globe to highlight the lifestyle, diet, outlook, and stress-coping practices that will add years to your life and life to your years. The new Blue Zone is Ikaria, Greece, where strong, sweet wine, family, and a Mediterranean diet all play a role in longer life. Also new in this book is a reading group guide, designed for groups to read about, discuss, and implement many of the simple changes advocated for better health. Region by region, Buettner reveals the "secrets" of longevity through stories of his travels and interviews with some of the most remarkable–and happily long-living people on the planet. It's not coincidence that the way they eat, interact with each other, shed stress, heal themselves, avoid disease, and view their world yield them more good years of life. Buettner's easy to follow "best practices" and list of healthy lifestyle choices from the Blue Zones will empower readers to live longer, healthier, more fulfilling lives.